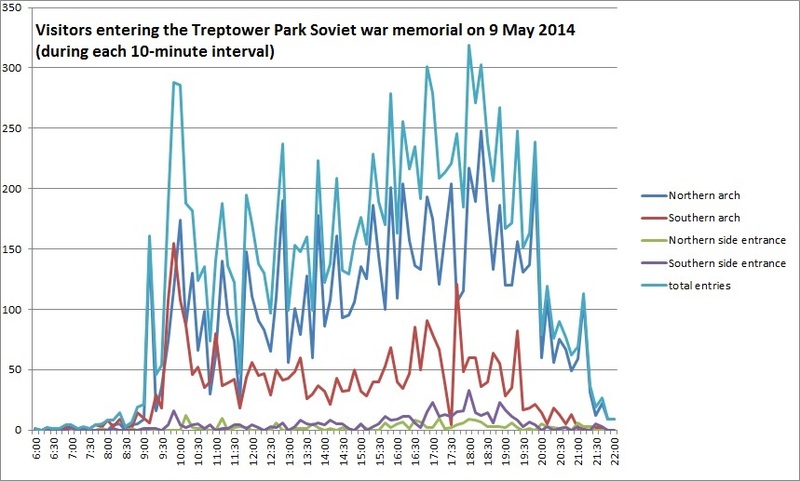 This year I decided to count visitors to the Treptower Park site. In previous years I had been struck by the contrast between what was obviously an overwhelming number of (very diverse) visitors to the site and the near-total ignorance of the event among non-visitors and in the German media. Having spent most of the day at the site on 9 May 2013, I estimated there were well over 10,000 visitors, perhaps as many as 20,000. This year I wanted to test my hunch. The results seem to confirm my impression: between 6 am and 10 pm we counted a total of 12,813 visitors. Unlike 2013, when Victory Day coincided with Ascension Day and Father’s Day and was gloriously sunny, this time 9 May was a working day and very rainy, so it is very likely (and my distinct impression) that there were many, many more visitors last year. The number only includes visitors to the actual memorial site and does NOT include those attending the Victory Day festival at the parking lot across Puschkinallee unless they also visited the site. I know from observation and interviews recorded last year that a significant number of those attending the festival never cross the street to see the memorial—out of indifference, laziness, or principle. Having formally interviewed the main organizer of the festival last year and talked to him again this year, I know that organizers have no way of counting participants, but even this year, despite the drizzle, the event was obviously attended by hundreds if not thousands of people. What made our task feasible is that the memorial can only be reached through a small number of gates. I placed student assistants at each of the site’s four entrances: two each at the northern and southern arches and one each at the smaller side entrances. (There is a fifth gate at the back, behind the main monument, but it is currently closed, and has been for a while.) Using mechanical counters and working in two eight-hour shifts, they counted every person coming in and going out. Another assistant and I acted as wildcards to let people have toilet breaks while continuing to count. At the larger entrances one person counted entries and the other exits; at the smaller side entrances, one student counted both. The results were recorded in notebooks in ten-minute intervals. The only people we did not count were the site’s gardener; uniformed police (of whom there were significantly more than last year, due to concerns over the Ukrainian crisis); and ourselves. Other than there were no exclusions (or attempts to differentiate) based on age, status (individual visitor, member of organized group, random jogger, etc) or any other variables. I know from regular observation and last year’s interviews that at least six distinct types of visitors come to the site on 9 May (visitors arriving from the former Soviet Union; Russian speakers living in Germany; people socialized in the GDR and their families; subcultural antifa activists; members of West German communist groups; and foreign tourists from other countries), and that members of each group tend to be surprised to learn about the others (or at least to underestimate the presence of some of the others groups, or dismiss them as unimportant) even if they have spent a lot of time at the site. However, compared to previous years it is my impression that this year there were somewhat fewer Germans across all categories, and probably more visitors coming directly from Russia or Belarus (this makes sense: it is harder to cancel or alter long-distance travel plans due to inclement weather than plans for a local outing). There also seem to have been fewer Russian speakers arriving from other parts of Germany as part of organized groups. However, I have no quantitative data to back any of this up. Counting both entries and exits allowed me to determine how many people were at the site during any given ten-minute interval, and also to test our accuracy. If our method had been completely error-free, the difference between arrivals and exits would be 0 at the end of the day (or positive: there were still maybe 10 stragglers at the site when we left, well after dark).As it happens the end result is negative (-34 – we counted 12,847 exits as opposed to 12,813 entries): a very small error, given the number of visitors and the number of counters. Of course 12,813 does not represent the number of unique visitors, as a certain number of people came and went several times, and (luckily) people do not have IP addresses. However, that number does not seem to be very high (mostly those who were setting up stands at the memorial, and a few people who went to pee in the bushes outside the northern side entrance and then came back in), so I think it is safe to say that approximately 12,000 people visited the site on that day. This entry was posted in 9 May by admin. Bookmark the permalink.